Sometimes I have a hard time making up my mind. This month I read three different historical novels that I wanted to recommend, but I couldn’t choose between them. So I decided to tell you a little bit about all three, and hopefully you’ll find yourself wanting to read at least one of them. These books are as different from each other as could be; different eras, different authors, different styles, but three novels that succeeded in sweeping me so totally into their world that I found myself wanting to stay a bit longer than the pages allowed. Washington’s Lady by Nancy Moser: Told in the first person, this book is an inside view of the life of Martha Custis Washington before and after she married her tall, handsome colonel. Widowed at age twenty-six, with two children, Martha Custis had experienced more than her share of grief. Now, as the wealthiest widow in town, she had several men interested in marrying her. But she isn’t interested in marrying again, for any reason but love. And that love can only be found with Colonel George Washington. Not interested in Martha’s money, George’s love for Martha is unbelievable true. And he dotes on her children almost as much as she does. Together, while the colonists find themselves in the precarious position of declaring freedom from a tyrannical king, George and Martha must give up their dreams of a quiet life because their fellow colonists depend on George to lead them toward that freedom. This book is a love story between a man and woman, as well as a love story between two people of faith and their young country. George and Martha make incredible sacrifices of love for the people of an emerging new nation. Nancy Moser puts a personal face on two historical figures that inspire others to take risks and follow dreams that seem unreachable. To read more about Nancy Moser and her true-to-life books, you can visit her website at: http://www.nancymoser.com/. Lady in Waiting by Susan Meissner: From the author of the phenomenal book, The Shape of Mercy, is a wonderful novel set in two different eras, about two women who share the same name. This book seamlessly gives readers the present day story of Jane Lindsay and a fascinating version of the historical story of Lady Jane Grey. Antique collector Jane Lindsay finds a beautiful antique ring shortly after her marriage begins to fall apart. Seeing the name Jane inscribed in the ring gives her a sense of connection to its original owner. Perhaps as a way to avoid dealing with her heartbreak, or because of it, Jane sets about on a mission to find out the history of the ring and ends up finding out a great deal about herself. Lady Jane Grey’s dressmaker, Lucy Day, effectively lures the reader in as she narrates the story of Lady Jane and how she came into possession of the ring. But it’s what happens next that will keep readers turning the pages, hoping innocent young Jane can avoid tragedy and find true love as she steadfastly stands up for what she believes. This book is an amazing story of faith and inner strength amidst the two vastly different settings. And as a delightful bonus, readers are treated to Lucy Day’s story as well. Right now I’m reading Susan Meissner’s latest book – A Sound Among the Trees. As expected, it is excellent. You can visit the author’s website at: http://susanmeissner.com/. Love Amid the Ashes by Mesu Andrews: This is the story of Job, as never before imagined. Mesu Andrews did a lot of research before writing this, her first published novel. Not only did she carefully research the Bible, but she also researched historical texts of the time. What she read fueled her imagination, and she penned Job’s story as only she could tell it. Also because of her research, Mesu merged the lives of Biblical characters Jacob, Isaac and Esau with the life of Job. This is also the story of Dinah, Jacob’s daughter, after she was rescued from Shechem by her brothers and brought home to live in disgrace. When her grandfather Isaac insists she marries a man from her Uncle Esau’s clan, Dinah is sent off to the land of Uz with Job, her distant cousin, with the expectation that she will marry Job’s son. What follows is an incredible story of faith that will touch readers on the deepest level. Is it possible that these two Biblical characters’ lives intersected? Once you read Mesu Andrews’s book, you’ll not only imagine it, you’ll be driven to your Bible to research for yourself, and you’ll undoubtedly put her March 2012 release, Love’s Sacred Song, on your TBR list. You can visit her website at: http://mesuandrews.com/. Suzie Johnson has won several awards for her inspirational novels (writing as Susan Diane Johnson), including the Maggie, Lone Star, Heart of the West, and Beacon awards, as well as finaling in the Touched by Love, Finally A Bride, Linda Howard Award for Excellence, and Virginia's Fool For Love contests. She is a member of ACFW, RWA, and is a cancer registrar at her local hospital. The mother of a wonderful young man who makes her proud every day, she lives with her husband and little kitten on an island in the Pacific Northwest. And although the beaches are rocky instead of sandy, lined with Madronas and Evergreens instead of Palm trees, and the surf is much too cold for wading, it is still the perfect spot for writing romantic fiction. You can visit her blog, Suzie's Writing Place at http://suzieswritingplace.blogspot.com/. Suzie, you are a master of book reviews and I want to read each one. Don't do this to me! I am always impressed on the number of books you read in a month. I'm especially interested in how Susan Meissner did the parallel stories. Sounds intriquing. over the next few days, SUPER AMAZING Gift baskets are being raffled off to raise money for Sandi Rog's medical bills. You receive one 'ticket' via each $5.00 you donate online. It's easy peasy, and a great way to help Sandi and bless her...and yourself. Oh, wow. These all sound awesome. There's just not enough reading time in a day! Right now I'm focusing on Early American for my new book, so if I had to pick one, I should go with the Nancy Moser. In fact, I could actually justify spending money on that one at the moment. I especially appreciate you mentioning all three of these at this time, Suzi, as I am a Christmas book-giver, and my family has grown so much that it would take 48 hours in a day to read everything BEFORE I give. Yet, I have often found that when I finally get around to reading them, later, I wish I would have chosen something different for this or that personality. Many times a cover or jacket copy makes the "flavor" sound different than what's underneath. So, it's nice to know just what it was that made these three come alive for you, even while they are all very different from each other. Christmas shopping aside, though, I'm going to read them all! Hey, Deb. Thanks. I'll tell you my secret for reading lots of books. Sometimes (a lot of times) I have a hard time sleeping, so I read. I've never been able to just get in bed, close my eyes and fall asleep. If I read a chapter or two, I relax enough to fall asleep. Other times, I still don't fall asleep and might read an entire book before falling asleep. Luckily, that doesn't happen very often. One thing Susan Meissner did that I really like is she gives you adequate time (several chapters) in one story before she switches to the other. That way you are familiar with the time period and the characters. Often when I read books that have two different stories happening, they switch stories a chapter at a time and my brain gets too boggled to follow the two separate stories. Dina, I do think you would like Lady Washington. The early American flavor comes through nicely. I can't wait to read your new book! Thanks, Lilly. I totally agree that books are often different than the jackets portray them. Not that this has anything to do with content, but one funny thing to me was actually the gorgeous cover for Lady Washington, versus the way Martha describes herself. The two just don't mesh. I do hope you don't feel I've steered you wrong when you read the books, and that you enjoy them as much as I did. :) Happy Christmas giving! Suzie, that's the time I read too, but if I've been writing until I'm too tired to stay awake, I don't get far in my bedtime reading either. I should catch up on my TBR after Christmas and I'm definitely interested in these three. 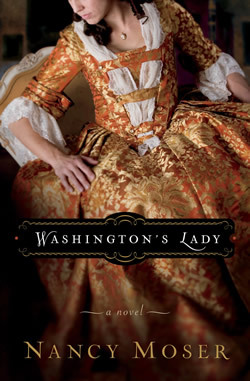 The Martha Washington cover is very much the style in historical covers. The joke is we see the dress but most heroines have their heads cut off. Then there's the argument over whether a reader wants a face or not? I'm not sure, but I know these gorgeous dresses would sell me on a book. I agree, Deb, that dress is gorgeous. And truly, you probably wouldn't want the Martha of our elementary school lessons to grace the cover because no matter how much we dislike it, without the outer beauty of the cover, people might not pick up the book and discover the beauty within the pages. Oh, man, these all sound great! I have the first two already and haven't gotten around to them. I am SO far behind. I know about being far behind, DeAnna! I'm considering reading out of order on my TBR because I received Melanie Dickerson's The Merchant's Daughter in the mail yesterday and I to read it NOW! This is just my not so humble opinion, but I think given the medieval element in The Lady in Waiting, you should read that one first. LOL. Yes, I got "Merchant's Daughter" yesterday, too. 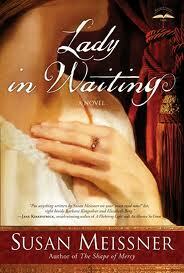 Yes, "Lady in Waiting" looks good, too. I have an embarrassment of riches. Me, too, DeAnna, me, too. We are blessed. I hope there are books in Heaven. Oh, excellent, Suzie. I agree. I want to read them, too. 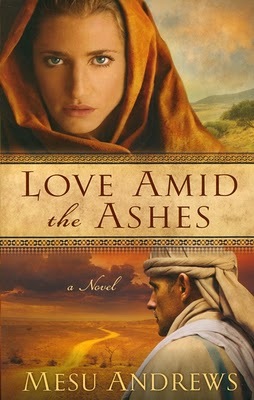 I've heard of them all, but have been especially intrigued with Love Amid the Ashes. You've upped my anticipation for this novel. Anita, I really, really, really :-), can't stress enough how eagerly I'm waiting for Mesu Andrews's next book. That's how much I loved Love Amid the Ashes. I am waiting for the next book as eagerly as I'm awaiting the next Julie Klassen book! If you like Biblical fiction, you will LOVE it. Did I stress that enough? Lol! Oh, Deb, I can't remember if I said thank you for posting the info about the raffle for Sandi Rog! Very important! I'm so glad you posted it. Another fabulous review, Suzie. I've been curious about this book. Thank you!